PhotoBoothless has been in the photo booth business since 2006 and constantly creating new ways to make our lives easier from event to event. In 2012, we created the first universal printer case of it’s kind. As photo booth professionals, it vastly improved our ability to decrease load in time, protect our equipment and provide a more professional appearance. We would like to introduce to you our second release in our printer case line, “The Traveler”. “The Traveler” was conceived through our frequent air and land travels throughout the US for our events. 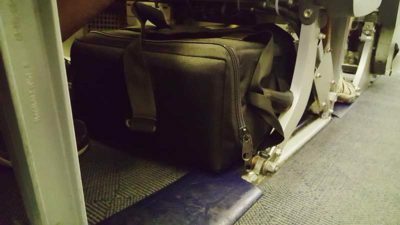 Although inspired by air travel, we found ourselves using the bag on a daily basis. The Traveler takes up a much smaller footprint, which directly relates to easier handling. Working with the engineers at Mitsubishi, the bag design accommodates for vertical transportation which allows you to place the printer on its side during transport to fit into tight spaces like the back seat of your car. In conjunction with our original universal bag, we found a good balance of weight and storage. Using The Traveler to carry and store our printer, we can then maximize the space in the original larger bag for storage of lighter or loose items all in one case, such as cables, grip tape, box of paper, power strip and other related products. For even easier navigation through the airport, we used a small foldable cart and strapped the bag tightly to the cart. 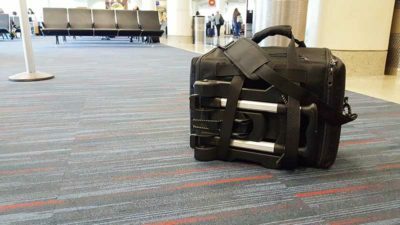 If you encounter stairs simply retract the cart handle and you can carry the entire case and cart as one unit with the heavy duty webbing handles. Pleasantly by coincidence, because it was not by design, when the dolly is not in use, you can slide the foldable cart between the handle webbings for easier handling. The cart pictured is the “Samsonite Luggage Compact Folding Cart.” We don’t endorse this product, and there might be different options, but it’s working out well for us.